Loon Lake is in the bottom left hand corner of this map, just south of the Bonaparte River. The red line that comes in from the west, to the top end of Loon Lake, was the part of route covered by the last post, see above. We are now speaking of the journey north from Loon Lake, crossing the Bonaparte River and continuing north to the west end of Green Lake. Brigade Creek led them down from the plateau to Loon Creek, which they followed west to the east end of Loon Lake. 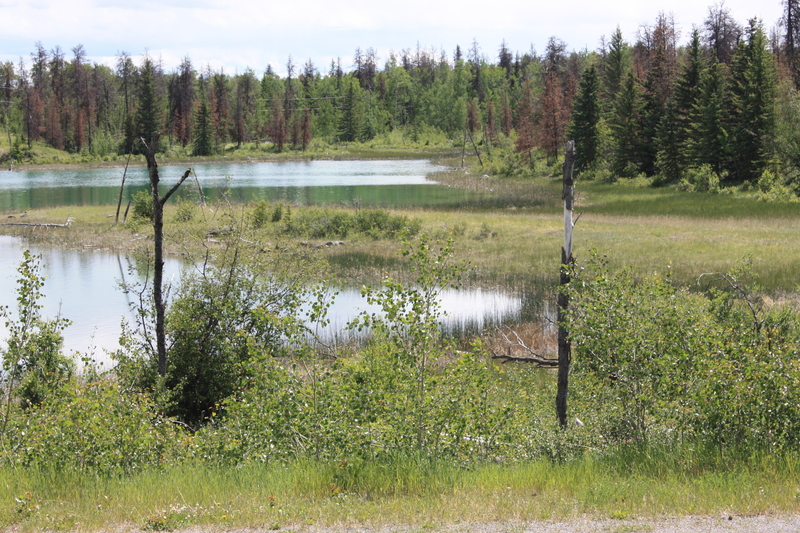 Anderson estimated that Loon Lake was about eleven miles from the Beaver Swamp [see last post for the location of this landmark]. From the east end of Loon Lake the HBC men mounted the Bonaparte Plateau, and traveled due north to the banks of the lower Bonaparte River [at a point west of Young Lake, which I believe divides the lower Bonaparte from the Upper]. They forded the Bonaparte, and Anderson estimated that this thirty-yard-wide ford was about nine miles from the east end of Loon Lake. He would be estimating the distance of course, time multiplied by the miles per hour a horse supposedly travelled in a walk.You can see their trail led them by switchbacks down to the banks of the Bonaparte River. 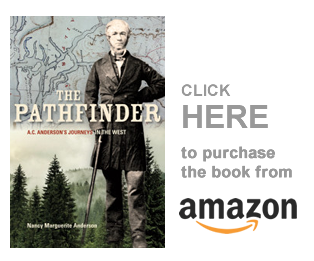 After they had forded the river, their trail led them by many switchbacks up a steep hill that Anderson described as being clearly wooded. Here they were atop another rugged, wooded plateau — part of the “Green Timber” plateau, a roughened, rocky land with numerous moraine ridges deposited on the earth’s surface by the Cordilleran ice-sheet that had covered the plateau two million years ago. The plateau’s glacial features included both kames [mounds], and eskers [snake-like ridges]. Some of these ridges, or eskers, were fifty feet in height and 100 feet in length. Between Fly Creek [which flows south into the Bonaparte River] and Green Lake, these ridges are well developed. George Mercer Dawson wrote that the old Brigade Trail followed the Fly Creek esker for miles — see his Report on the Area of the Kamloops Map Sheet, British Columbia [Ottawa: Geological Survey of Canada, 1895]. So Fly Creek is on Anderson’s map. It is that wiggly line that flows from the Chaine des Lacs into the Bonaparte, and the esker, that the brigades followed, runs on its north east bank. 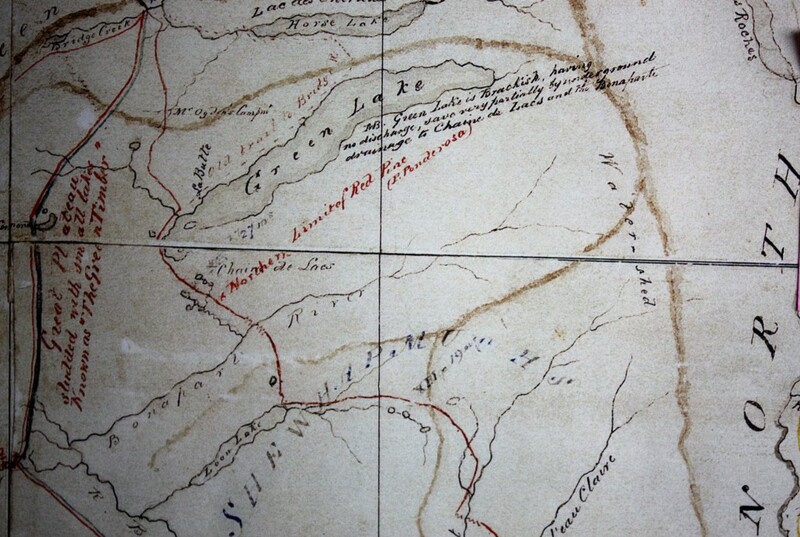 The Fly Creek esker led the brigaders north to the Chaine de Lacs, and Anderson said it was about seven miles from the banks of the Bonaparte to the Chaine de Lacs. The trail led from the Chaine de Lacs [which includes modern day Hutchison Lake] to the west end of Green Lake, which Anderson described as a beautiful lake. This is the marsh at the west end of Green Lake, British Columbia. We are looking south, toward Kamloops and Loon Lake, and the Green Timber is behind the photographer. The Lac Vert, or Green Lake, so called from the sea-like tint of its waters. This lake, in length some thirty miles, is a beautiful sheet of water. Several streams run into it; but it has no free outlet. There is a slight subterranean drainage only, into the Bonaparte [River], a tributary of the Thompson. The water, therefore, kept within limits chiefly by evaporation, is brackish. If you look at Anderson’s map, above, he calls the plateau to the west of Green Lake “the Green Timber.” To him, this plateau was not part of what he called the “Green Timber.” However, to Sylvester, who traveled over the brigade trail in 1859, this was the Green Timber, and today it is still called the Green Timber Plateau. For me, this has been very confusing, and I am pleased to have it finally straightened out. It is, however, interesting, how names move around, and how different persons called different places by different names, even though they were all in the territory at about the same time. The next post will take a little exploration and research, mostly because of the Butte next to Green Lake. As I said above, the Cordilleran ice-sheet left behind both kames [mounds] and eskers [ridges]. Is this a mound? I ask this question because in the French language a butte is a mound. Or is this an actual Butte — which I believe is a volcanic feature. There are other buttes in this area: Lone Butte, to the north, and Olsen’s Butte at the east end of Green Lake. Neither are anywhere close to where Anderson located “the Butte” on the shores of Green Lake. Did Anderson make a mistake, and mark the butte in the wrong place? That’s possible. Of course, when I was at Green Lake I hadn’t even realized that “La Butte” was marked on his map, and didn’t look for it! At the moment I presume it is Olsen’s Butte he referred to, but I am not entirely comfortable with that presumption, as Olsen’s Butte is further east than this map seems to indicate. So you see the difficulty. Copyright, Nancy Marguerite Anderson, 2016. Updated and Rewritten, March 2017. All rights reserved. I make ‘Peter Ogden’ to be PSO2-correct? How does Timothy equate with alfalfa-I have them both in a front pasture and they are nothing alike? Hmmmm. Quick check, error. But I have the same error in my grasses post, so will look it up and correct the information. Thanks. Yes. Peter Ogden is PSO2.